Overlooking the Durance Plain on the southern slopes of Luberon, the Domaine de Fontenille is among the few provincial proprieties that have retained their original appearance. Bordered by the Luberon foothills and mountains and the Montagne Sainte Victoire, this country house, characterized by its classical architecture, lies within its landscaped grounds protected by cedars and plane trees, surrounded by wild landscapes and vines as far as the eye can see. Built between the late 16th and early 17th century, the Fontenille country house appeared on the cadastral plan in 1638 with 12 ha of vines. The property gradually expanded to reach 35 ha in 1748. Stronghold of the Savornin family from 1640, Alphonse de Savornin added a manor house to the existing buildings in 1850. The main entrance and ornamental lake as well as the main trees in the park date from this period. His granddaughter, Amélie, continued to develop the park. She was Fontenille’s last occupant. Wine growing at Fontenille dates back to early 17th century. Laurence Berlemont, oenologist, agronomist and a specialist in Provence wines, began restructuring the Domaine in 2013 with the aim of restoring the Domaine to its original size: 35 ha of vines in one geographical area around the Domaine. As an advocate of sustainable farming, the Domaine has been converting itself to organic farming since 2014, and benefits from the latest wine making techniques in a new wine cellar with traditional architecture. Different types of vinification are being promoted thanks to the optimization of interior space: rounded concrete tanks placed in a semicircle, rows of stainless steel tanks immersed in wooden barrel cellars. The Domaine de Fontenille enjoys exceptional terroir. The vines draw their strength from the clay, limestone and stony soil. The slightly steep slopes provide perfect sunshine and better water drainage. The Provence Mistral naturally cleans the grape. The vine is tended so as to minimize treatments and ensures that the grapes obtain the best possible maturity while respecting natural cycles. Good wine depends primarily on the quality of the grape. 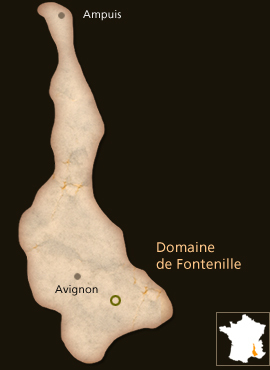 The Fontenille vineyard consists of Luberon PDO characterized grape varieties: Syrah, Grenache Noir, Grenache Blanc, Vermentino, but also more advanced varieties to create special cuvées: Viognier, Petite Syrah, Mourvèdre. Production is split between red wines (35%), white wines (15%) and rosés (50%). The 2015 Cuveé Rosé, 1st cuvée orchestrated by Laurence Berlemont, has already received several medals. A symphony full of nuances and variations. Very subtle notes of roses with notes of exotic fleshy fruits (peach, nectarine). Next, we have enveloping and round attack for a smooth first approach. It is then rising in intensity to finish with fireworks of acidity, minerality and tension. Clay and limestone soils facing south/south-east. Located at the bottom of Luberon mountain. Certified organic. Green pruning. Early morning mechanical harvests take place from 2am to 8am, to benefit from juices’ freshness, where Syrah is picked at its optimal maturity, and Grenache Noir is slightly over-ripe. Yield is 45hl/ha (maximum yield allowed by the AOP is 55hl/ha). Selective sorting during the harvest. Destemming, then crushing. Direct pressing with pneumatic press. Separation of pressed and free-run juices (after tasting). Cold static settling for a minimum of 48 hours. 3 weeks mono varietal fermentation in stainless steel tanks at15°C. In stainless steel tanks over fine lees until Christmas. Clarification by racking and filtration before bottling. A generous and gourmet rosé made to be shared with friends. Delicatessen, grilled beef, red mullet fillets, salmon carpaccio, octopus salad, veal tajine… Here, place to the audacity, in any season. Because yes, thanks to its beautiful generosity, you can also pair this rosé with most of your winter dishes. A blend of a multitude of desserts, this wine is a paradox. The nose can be compared to a superposition of several layers of aromas. Chocolate and cocoa bring an almost childish and gourmand touch. The second layer of fresh fruits ( cherry, strawberry, raspberry ) offers elegance and balance. In the mouth, the attack begins with delicacy leading to notes of bitter chocolate and spices. Clay, limestone and marl soils. Located at the bottom of Luberon mountain. Currently converted into organic farming. Vinyards are facing South. Manual harvests take place early in the morning, after maturity control and tasting the berries. Grapes from a selection of parcels. Rigorous green pruning from bud break to harvest ( disbudding, thinning, leaf removal ). Yield of 30hl / ha, below the maximum yield allowed by the appellation (55hl / ha). Transport of the grape harvest via vibrating trucks after a first sorting on the parcel. 2nd manual sorting on vibrating sorting table at the entrance of the winery. Destemming and then crushing before gravity incubation. Short cold pre-fermentation. Mono varietal fermentation under controlled temperature in concrete tanks and oak barrels. Post-fermentation maceration during several weeks before juices are poured and marcs pressed. Malolactic fermentation occurs before winter in concrete tanks and / or oak barrels. Concrete tanks and oak barrels (55hl & 75hl) for more than 12 months. To contrast this full-bodied wine, dare to take risk: boar auburn with chocolate and red berries, lamb roasted with thyme, roast duck with ceps… Do not be mistaken, if this red guard knows perfectly how to marry with powerful meats, it also knows how to harmoniously accompany delicate desserts: black forest gateau or chocolate fondant with red fruits. Copyright 2019 Paul M. Young Fine Wines. All rights reserved.